The Suffolk Massage Stick measures 18 inches long and is designed with comfortable soft foam handles. But its magic comes from the hard rotating beads that run along the stick’s length. 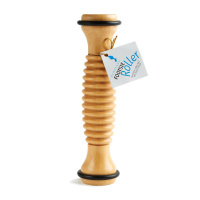 Simply move the stick over your body’s muscle areas, and the rolling action of the beads works wonders. It not only feels great, but this will also improve your strength and flexibility by releasing tight muscles. The Massage Stick can also be used as a balance stick to improve core stability, placing it on your back or other areas. Simply practice various dance positions while trying to keep the stick from falling off (for example work on Arabesques with the stick balanced on your lower back).